Long gone are the days when you had to give your child your phone or tablet to keep them from getting themselves in trouble. Now, with tablets geared toward children, they can have a tablet of their own. However, placing the internet in the erratic hands of a young, innocent child is reason enough to make any parent worry. Luckily, LeapFrog, a trusted brand that has been making great children’s education technology for years, came out with a line of tablets that are perfect your little one’s sensitive, growing brain. Do yourself a favor and pick up a LeapFrog so you can claim back the devices that are yours. You’ll have some much needed, guilt-free time to yourself as your child discovers just how fun learning can be. 1. What Is a LeapPad? LeapPad, LeapFrog’s version of a tablet, is full of great educational content that will help your child prepare for kindergarten and beyond. Some tablets even allow your child to access popular games that would be available on your typical Android device. 2. How Does a LeapPad Work? With a special LeapSearch web browser, your child can have access to the internet but will only encounter child-safe subject matter. Additionally, LeapPads come equipped with useful parental controls that allow you to control and track how your child uses the tablet. The LeapPad’s design serves the dual purpose of being attractive to children while making the tablet so durable it can be thrown down a flight of stairs without breaking. 3. Where Can You Buy a LeapPad? 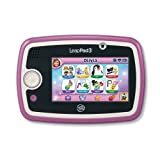 You can buy a LeapPad directly from LeapFrog, Amazon or through other major retailers. 4. How Much Does a LeapPad Cost? LeapFrog tablets are often more expensive than most of their competitors, such as the Amazon Fire. However, their educational content is unique and created by LeapFrog’s educational experts. These tablets all cost under $150 and come with a one-year or two-year warranty. We reviewed all of the tablets that LeapFrog sells and rated them based on their durability, performance, parental controls and educational content. We also considered customer reviews and other review articles. The two oldest models of LeapPads are the most affordable with prices under $100. The newest and highest-rated LeapPad costs about $400. You can purchase these tablets on various sites, including big-box retailers like Walmart and Amazon. Prices do fluctuate with different promotions and can vary from store to store. From LeapFrog, makers of the #1 kids learning tablet with all the features of LeapPad2, now in bright, bold colors. Ages 3-9. Features 4GB memory, 2 front and back cameras and video recorders, music player and more. The LeapPad Glo is a new version of the LeapPad 2 tablet with all the same features but in teal and purple. The LeapPad Glo is designed to be very durable to survive the handling of young children. This tablet requires 4 AA batteries and does not have a rechargeable internal battery. Since the LeapPad Glo has the lowest resolution and slowest speed, it is the cheapest tablet at less than $300. The LeapPad Glo comes with nine apps, including an art studio and music player, and if purchased, can also connect to the learning library for access to 1,000 more games and apps that are designed to educate the children who use them. The tablet also includes front and back cameras with video recording capabilities. 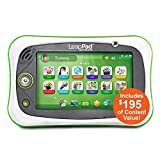 Unlike most of LeapFrog’s other tablets, the LeapPad Glo does not allow peer-to-peer play. This tablet comes with Leapfrog’s personalized learning program that can detect a child’s learning level and adapt to his or her abilities as they change. 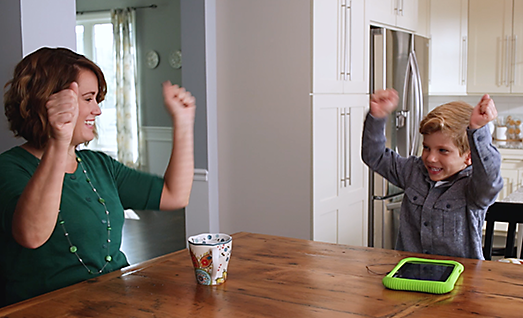 Additionally, the LeapPad Glo can be played with a finger, stylus or shaking and tilting movements. The LeapPad 3 is a high-performing tablet by LeapFrog that uses a quad-core processor with speeds up to 1.0GHz. This tablet can access WiFi and allows peer-to-peer playing. Since this tablet can access the internet, there are parental controls included on the tablet that will enable parents to decide what they want their child to be able to access. You can even edit the controls later on as the child grows older. Parents can also opt to receive updates to see how their child is progressing. This tablet is strong enough to withstand handling from children due to its shock-absorbing frame and protective, highly responsive screen. Children can enjoy six or more hours of play on this long-lasting tablet. With access to ten included apps and the ability to purchase access to the learning library, they will need all the time they can get. The LeapPad Platinum is designed to deliver stunning graphics, with a resolution of 1024 x 600 pixels, in a sleek design that even grown-ups will love. This tablet doesn’t lose any of its durability with its striking appearance either. The LeapPad Platinum includes wrap-around bumpers and a shatter-safe screen, which is sure to be safe in a child’s hands. This tablet is very responsive and fast (much faster than the LeapPad Glo) and uses an impressive quad-core processor. This WiFi-powered, internet-accessible tablet has the security of parent controls like password protection and time limits. 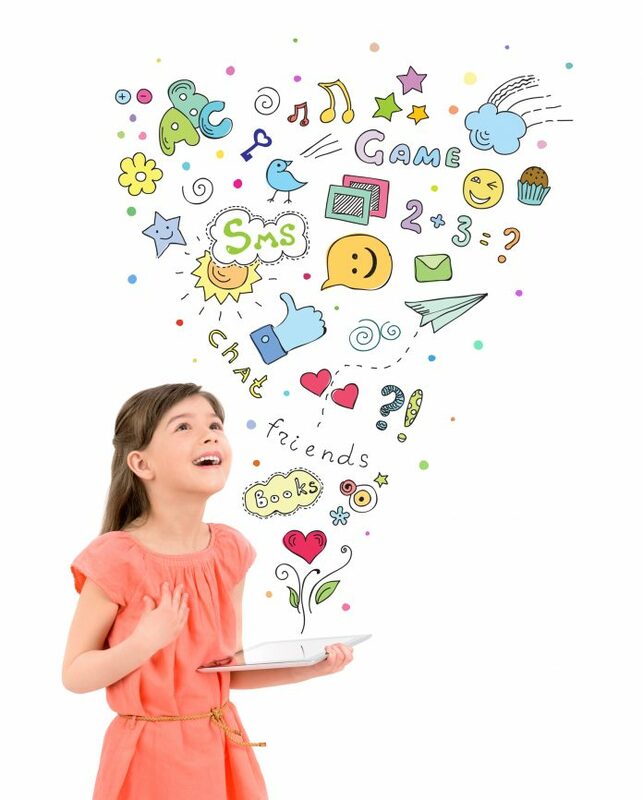 Children can only access age-appropriate content through LeapSearch and the App Center. Children can even make a wish list with all the apps they want for parents to see later. This LeapPad is compatible with Imagicard cartridges and even comes with a few to try out. The LeapPad Ultimate has won some pretty impressive awards, including the Tillywig Toy and Media Brain Child Award, the Smart Media Academic’s Choice Award, and the National Parenting Publications Product Award. The LeapPad Ultimate can still use the imaginary cartridges that were available on previous models of LeapPad, and you can carry over any apps you downloaded on previous devices. This LeapPad still uses a quad-core processor and can connect to the internet. Children can play the games from cartridges even when the device is offline. The LeapPad Ultimate comes with $ worth of preloaded content when you purchase it. The LeapFrog Epic is the first tablet to use Android’s 4.4 Operating System. This tablet won a Kid screen Award in 2017, and it is no surprise that it did. 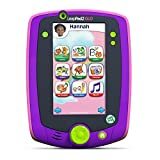 This tablet is unique from any of Leapfrog’s other tablets because it has all of the features children and parents love about the LeapPad, but with access to favorite, kid-friendly Android apps as well. Parents will also appreciate the more thorough parental controls on the LeapFrog Epic, allowing further customization of what parents want their children to have access to. The LeapFrog Epic has a lot more memory space with 16GB of available space. You can even purchase a micro SD card to push that memory space to 32 GB. One con of the LeapFrog Epic is that it isn’t physically compatible with the Imagicard cartridges. However, you can still buy or carry over digital copies of the cartridge games. Also, the LeapPad Epic comes preloaded with 20 apps. It includes many games and demos, utilities like a weather and calculator app that you would find on a typical adult tablet, creativity apps, some music albums, a video, and an eBook. All of these preloaded apps allow adventurous users to explore all that the LeapPad Epic has to offer. The LeapFrog Epic Academy Edition is just like the regular LeapFrog Epic but with extra interactive educational content. Both the LeapFrog Epic and the LeapFrog Academy have won numerous awards. This LeapPad introduces the LeapFrog Academy app, which guides the child through a story that educates him or her in a fun, interactive way. Children start the app by choosing and customizing an avatar that they can buy more clothes for buy earning marbles on their adventure. The app does not require WiFi and includes fun videos, eBooks, puzzles, games, music and art. Upon purchasing the LeapFrog Epic Academy Edition, you receive a three-month trial to the Academy app and can then choose to pay $7.99 a month. There is no question that the LeapFrog Epic, including the Academy edition, is the best LeapPad on the market. This LeapPad has great screen resolution, a fast quad-core processor, extreme durability, a ton of memory space, and it can access Android apps, making it the ultimate children’s tablet. 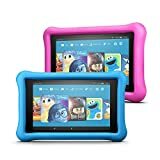 What sets this tablet apart from the other LeapPads in this guide is its use of Android, which allows your child to have all his or her favorite apps in one place.